Bittrex is a cryptocurrency exchange founded in 2014 by three cybersecurity engineers. Its mission is to help advance the blockchain industry by fostering innovation, incubating new and emerging technology, and driving transformative change. This US-based exchange boasts its secure platform and fast deposits and withdrawals. Follow these steps for you to start trading on Bittrex. Click here to access the exchange site. Just like most exchanges, let’s start by setting up an account to gain full access to the platform features. Click on either “Register” or “Sign Up” on Bittrex. Type in your email and password. Re-confirm your password and click on the agreement box. Click on the “Sign-up” button to continue. To view the registration message, you need to open the email that you’ve registered for Bittrex. Click on the link that you received through email as instructed. 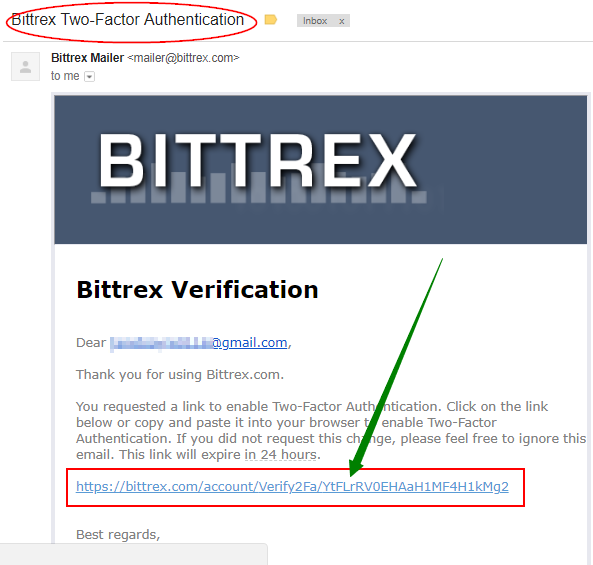 The link should take you to the Bittrex page saying the email confirmation has been successful. Fantastic! You now have an account on Bittrex. After signing up on Bittrex, you are required to create your profile as a way of getting to know you. This is the initial step prior to fully verify your account. Click on “My Profile” and completely fill out the form, then click on the “Submit” box. The page refreshes and redirects you to the verification process. Click on the “Start Verification” button. You can either capture your ID using your device’s camera or upload it. Follow the prompts after uploading the photo. After submitting the required papers, the screen displays that your documents are being verified. Then the message confirms that the documents have been received. 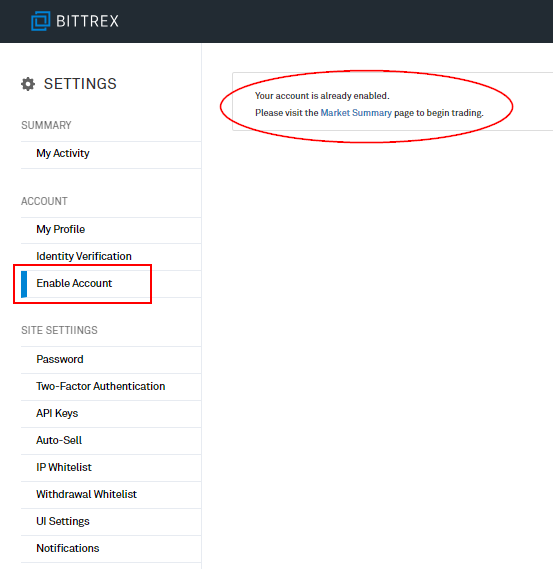 To confirm that your Bittrex account has been enabled, click on “Enable Account” and you will see a confirmation on the screen. Super! 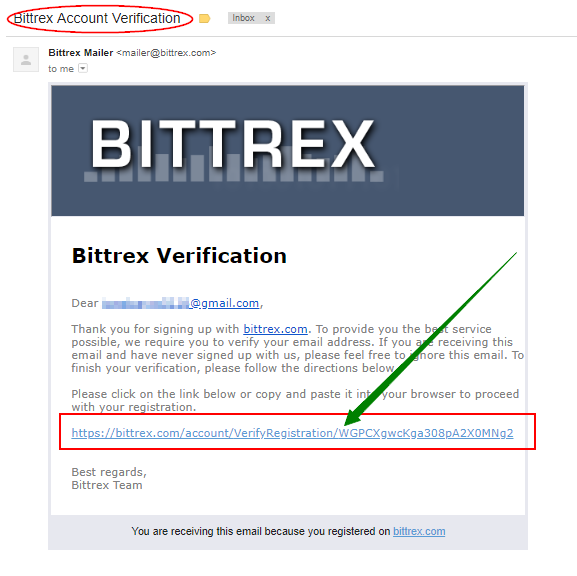 You have verified your Bittrex account. 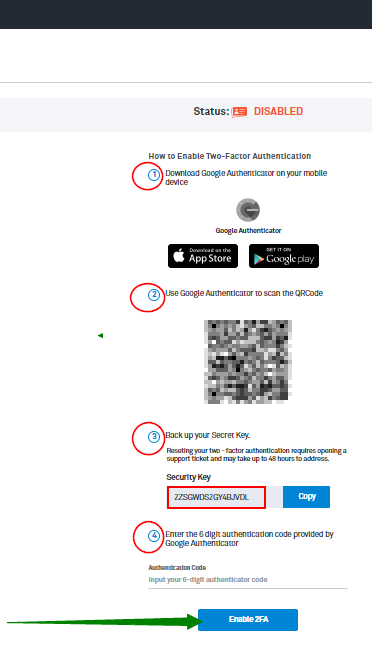 Two-factor authentication, also known as 2FA, is an extra layer of security or added protection which we refer to as multi-factor authentication. Not only the username and password are required but also a piece of information that only a user possesses. This process is to confirm a user’s claimed identity. The 2FA process helps lessen the number of identity theft cases as well as phishing via email. It would be harder for potential intruders to gain access and steal someone’s identity and personal data without that piece of information that only the account owner knows. In the case of exchanges what the user has are his/her login details such as the username and password. The form of 2FA that a user possesses for this instance is a token or code. The code can be received either through SMS on a user’s mobile phone or via applications like Google Authenticator or Authy. Click this if you want to know more about Authy. You can also download the app through the link provided. 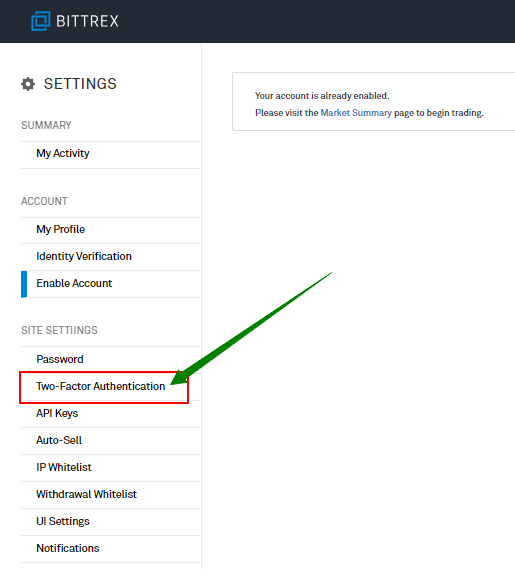 In this step, we will activate 2FA on your Bittrex account by clicking on “Two-Factor authentication” under the “Settings” menu. Scan the QR code and enter the numbers under “Authentication Code” and remember to copy and save your Secret Key. This is very useful because in cases of phone loss, you can easily recover 2FA without waiting for too long. 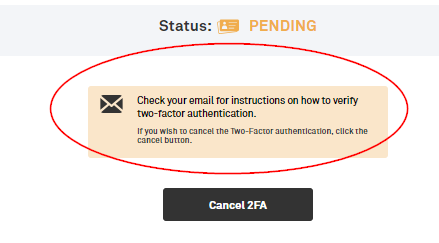 Moving on, click on the “Enable 2FA” box to continue. The status reflects as “Pending” and to fully activate 2FA, you need to check on the instruction sent to your email. The instruction basically asked you to click on the link attached as it expires in 24 hours. The link redirects you to the Bittrex page where you need to type in the code from the Google Authenticator app. Click on “Enable Two-Factor Authentication” to continue. You will then be able to see that the activation is finished and has been successful. Excellent! Your Bittrex account is now safe to use. As we know, funding is an essential process and now that your Bittrex account is fully secured, it’s time to add money for you to start trading. To start, click on “Wallet” which routes you to the “Account Balances” page. This is where you can select your currency to deposit. Initially, the page seems empty. You may want to click on “Show zero balance” to view all available currencies or directly type in your selected currency. So, in this example, we will deposit Dash. After typing in BTC, the list filters and displays BTC only. There are two icons beside the Dash, and for deposit, select the green icon. A new box pops-up. Click “New Address” to generate your address. Please make sure to read the Dash deposit instructions if they are available. Some coins require a minimum amount to be sent before they are credited and some ask for a message/payment/tag/memo. Therefore, you must send Dash to the address Bittrex provide and attach the needed message/payment/tag/memo to the deposit for Bittrex to route it to your account. Also, make sure that you only send the same type of coins to the address. Meaning, if you generated a Dash address you deposit Dash to it and not some other coin. If instructions are not followed, you will risk losing your funds permanently. For Fiat money deposit, follow the same steps, but first, read important instructions here. After the deposit process, you can check your transactions under “Pending Deposits” and “Deposit History” when you scroll down the page. Way to go! You have funded Dash on your Bittrex account. 5. Start to trade Dash on Bittrex. It’s time to buy your first Dash on your funded Bittrex account. Click on “Markets” to view your selection. Click on your preferred currency. In this example, we will buy Bitcoin through USD. Go to “Buy” and fill out the form with the amount/quantity and click on the “Buy Dash” button to continue. Order history is available if you scroll down a bit on the trading page. Congratulations on earning your first Dash on Bittrex! Transferring Dash from Bittrex to other exchanges. How to transfer Dash from Bittrex to Bits Blockchain? How to transfer Dash from Bittrex to BCEX? How to transfer Dash from Bittrex to B2BX? How to transfer Dash from Bittrex to Upbit? How to transfer Dash from Bittrex to OEX? How to transfer Dash from Bittrex to Fisco? How to transfer Dash from Bittrex to Qryptos? How to transfer Dash from Bittrex to OOOBTC? How to transfer Dash from Bittrex to EXX? How to transfer Dash from Bittrex to gate.io? How to transfer Dash from Bittrex to Kraken? How to transfer Dash from Bittrex to Indacoin? How to transfer Dash from Bittrex to CEX.io? How to transfer Dash from Bittrex to Bibox? How to transfer Dash from Bittrex to HitBTC? How to transfer Dash from Bittrex to CoinEx? How to transfer Dash from Bittrex to Simex? How to transfer Dash from Bittrex to BitBay? How to transfer Dash from Bittrex to Binance? How to transfer Dash from Bittrex to xBTCe? How to transfer Dash from Bittrex to YoBit? How to transfer Dash from Bittrex to SouthXchange? How to transfer Dash from Bittrex to Bithumb? How to transfer Dash from Bittrex to Lykke? How to transfer Dash from Bittrex to LiveCoin? How to transfer Dash from Bittrex to BitInka? Transferring Dash from Bittrex to wallets. How to buy Dash on HitBTC? How to buy Dash on OOOBTC? How to buy Dash on Simex? How to buy Dash on BitInka? How to buy Dash on YoBit?